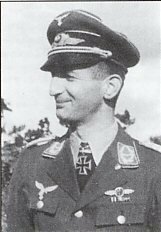 FALCK Oberst Wolfgang, awarded the Knight's Cross in October 1940. Falck was known as "the Father of Night Fighters", serving first with JO 2, followed by ZO 76. In June 1940 he was given the task of forming NJO 1 and became its first Kommodore, initially flying MEllOs. He was later responsible for introducing and deploying the Heinkel HE219 which proved superior to any other night fighter of the war.